) and prevents oxygen-rich blood from reaching the heart. This is predictable chest pain that occurs in a certain situation such as with walking briskly or upstairs, and is relieved with rest. It often can be managed with lifestyle changes and medications to prevent heart attacks and disease progression, and to control the chest pain. Drugs include low-dose aspirin, lipid-lowering agents, beta blockers, calcium channel blockers and nitrates. Unstable angina is diagnosed when there is new or worsened chest pain consistent with angina sometimes with ECG changes, but blood tests DO NOT show markers for heart attack. 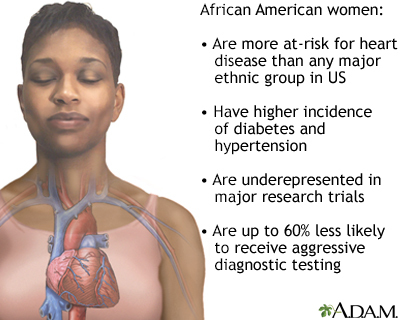 Unstable angina is often considered a precursor to a heart attack. NSTEMI (Non ST-segment Elevation Myocardial Infarction). This condition is diagnosed when similar symptoms and ECG changes are seen as with unstable angina, but blood tests are positive for heart muscle damage. STEMI (ST-segment Elevation Myocardial Infarction). 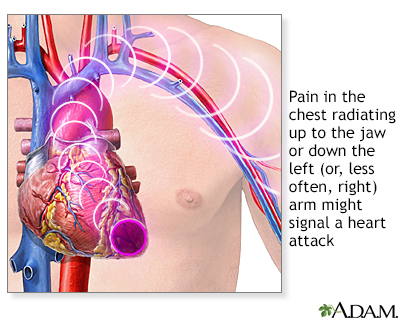 This condition is diagnosed when angina is described and specific ECG changes and blood tests confirm a heart attack. This type of heart attack involves the full thickness of a portion of the heart muscle. 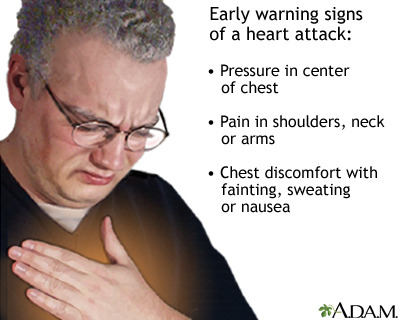 Chest pain or discomfort (angina) is the main sign of a heart attack. It can feel like pressure, squeezing, fullness, or pain in the center of the chest. Often the pain radiates to the neck, jaw, shoulder, or down the left arm. People with coronary artery disease who have stable angina often experience chest pain that lasts for a few minutes and then goes away. With heart attack, the pain is intense and usually lasts for more than a few minutes (typically 30 to 60 minutes). The feeling may go away, but then come back, although it can be persistent. Discomfort in the upper body. People having a heart attack may feel pain or discomfort in the arms, neck, back, jaw, or stomach. , which can occur with or without chest pain. 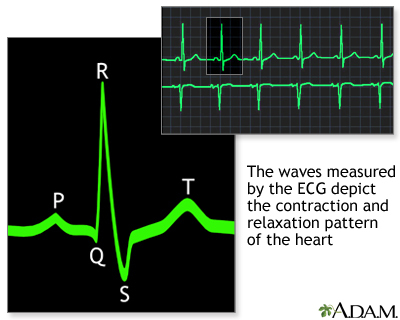 These waves follow the ventricular contractions. Most people will receive nitroglycerin during and after a heart attack, usually under the tongue. Nitroglycerin decreases blood pressure and dilates (makes bigger) the blood vessels that feed the heart muscle, increasing blood flow. Nitroglycerin may be given intravenously in certain cases (recurrent angina, heart failure, or high blood pressure). Morphine not only relieves pain and reduces anxiety but also relaxes blood vessels, aiding the circulation of blood and oxygen to the heart and lungs. Morphine can decrease blood pressure and slow down the heart. In people in whom such effects may worsen their heart attacks, other drugs may be used. 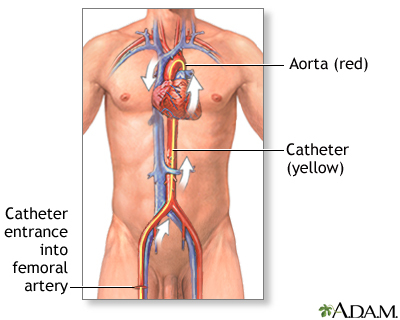 , is the preferred emergency procedure for opening the arteries. Angioplasty should be performed promptly for patients with STEMI heart attack, preferably within 90 minutes of arriving at a hospital capable of performing the procedure. 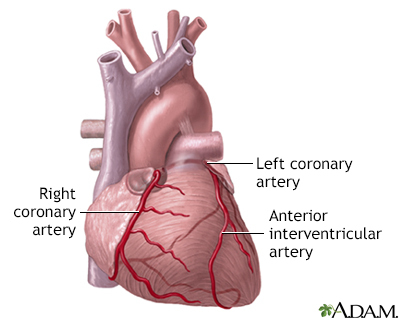 In most cases, a stent is placed in the artery to keep it open after the angioplasty. Guidelines recommend PCI for all people with STEMI attacks who have experienced symptom onset within the past 12 hours. 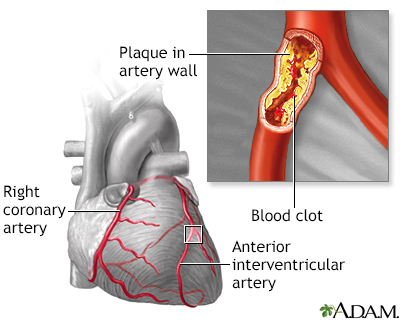 (clot-busting drugs) are the standard medications used to open the arteries. A thrombolytic drug should be given within 12 hours after the onset of symptoms. People who arrive at a hospital that is not equipped to perform PCI should receive clot-busting therapy within 30 minutes of arriving at the hospital and then are usually transferred to a PCI center without delay. 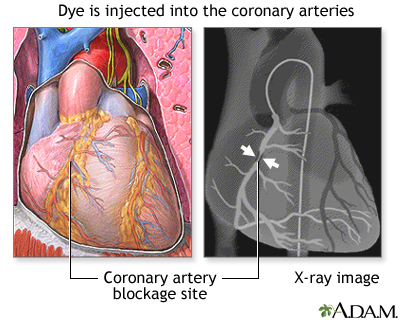 (CABG) surgery is sometimes used as an alternative to angioplasty. Referral for CABG depends on the location and number of blockages/narrowings as well as other factors such as the presence of heart failure, diabetes and other medical problems. The timing of emergency CABG varies on the situation. It may be performed immediately or in a more delayed fashion. 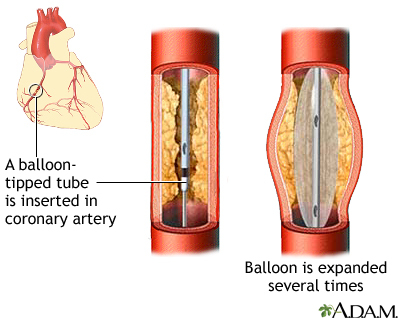 , in which a tiny deflated balloon is passed through the catheter to the vessel.
. An expandable metal mesh tube that is implanted during angioplasty at the site of the blockage. The stent may be bare metal or it may be coated with a drug that slowly releases medication. This medication decreases re-narrowing of the stented area. , which are used to reroute the blood. The blood vessel grafts are placed in front of and beyond the blocked arteries, so the blood flows through the new vessels around the blockage. 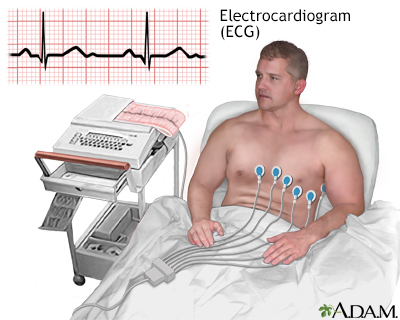 is a deviation from the heart's normal beating pattern caused when the heart muscle is deprived of oxygen. Aspirin is an antiplatelet drug. An aspirin should be taken immediately after a heart attack begins. It can be either swallowed or chewed, but chewing provides more rapid benefit. If the patient has not taken an aspirin at home, it will be given at the hospital. It is then continued daily (usually 81 mg/day). Using aspirin for heart attack patients has been shown to reduce mortality. It is the most common anti-clotting drug, and most people with heart disease are advised to take it daily in low dose on an ongoing basis. Aspirin can increase the risk for upper gastrointestinal bleeding. A combination drug containing aspirin and omeprazole (a proton pump inhibitor) was approved in 2016 by FDA for people who require secondary prevention of heart attack but who are at risk of developing gastric problems due to aspirin. , a thienopyridine, is another type of antiplatelet drug. 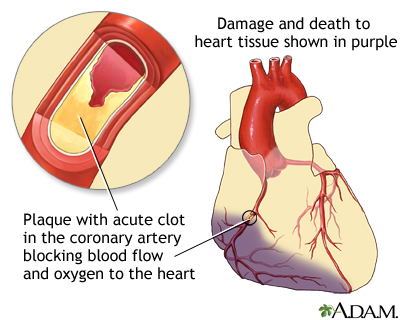 Clopidogrel is started either immediately before or right after angioplasty/PCI is performed. It is also begun after thrombolytic therapy. People who receive a drug-eluting stent should take clopidogrel along with aspirin usually for at least 1 year to reduce the risk of clots. Some people may need to take clopidogrel on an ongoing basis. Clopidogrel can increase the risk of upper gastrointestinal (GI) bleeding. Discuss with your doctor whether you should take a proton pump inhibitor (PPI). PPIs can reduce the risk of GI bleeding but some may also interfere with clopidogrel's anti-clotting effects. is a thienopyridine that may be used instead of clopidogrel in people with ACS. It should not be used by people who have a history of stroke or transient ischemic attack. is another antiplatelet approved for people with ACS. It works differently than thienopyridines and must be taken twice a day. is a new type of antiplatelet drug approved to lower risk of heart attack, stroke, or heart disease death for people who have had a heart attack or who have peripheral artery disease. It is the first in a new class of drugs called protease-activated receptor-1 (PAR-1) antagonists. People who have had a stroke should not use this drug because the risk of bleeding is too great. These powerful antiplatelet drugs include abciximab (ReoPro), eptifibatide (Integrilin), and tirofiban (Aggrastat). They are administered intravenously in the hospital and are used around the time of revascularization procedures [angioplasty/PCI or coronary artery bypass graft (CABG) surgery].